41-year-old Christopher Hinds was connected to treatment through Project Point, a pilot connecting ER patients with addiction treatment. On the way back home, Hinds couldn’t wait anymore. He says he went into a Subway restaurant and snorted the powder he had just bought. He thinks it was actually fentanyl, a synthetic opioid much more powerful than heroin. He remembers his vision getting blurry soon after he exited the restaurant. “I don't remember anything after that, so I imagine that's where I fell out,” he says. He collapsed in someone’s yard. His friend took off, and somebody called 911. Hinds says it was his fifth overdose in three months. Thousands of people overdose every year across the U.S. The ones who survive are often taken to emergency rooms. In 2014, there were 538,100 opioid-related ER visits, according to the Healthcare Cost and Utilization Project. So far this year in Indianapolis, where Hinds lives, EMS has recorded 1,200 emergency runs during which patients required the opioid overdose antidote naloxone. Hundreds of those overdose patients are transported to the emergency department at Eskenazi Hospital for treatment and observation. 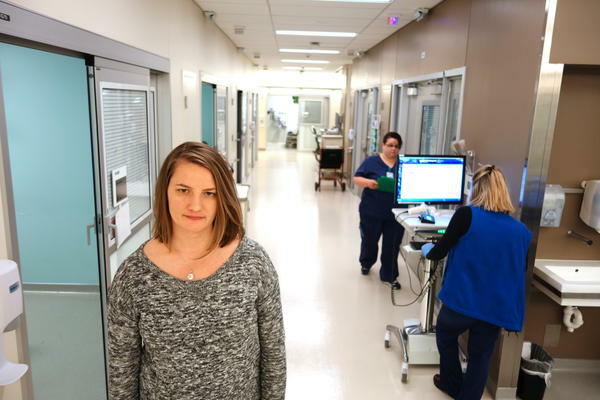 Some emergency room doctors see this influx of patients as a missed opportunity — and at one hospital in Indianapolis, they’ve started to try to intervene to connect their patients with treatment instead of simply discharging them. Brucker and her colleagues at Eskenazi Hospital have started to do more. In early 2016, they piloted a program, called Project Point, giving overdose victims concrete support to get into treatment. A staff member will meet with the patient at their bedside and talk to them about treatment options. If the patient is willing, staff will make them an appointment with an addiction specialist. They also discuss using clean needles, using naloxone and getting tested for diseases such as hepatitis C that are spread through injection drug use. Funding from the Fairbanks Foundation received earlier this year will allow the program to expand (The Fairbanks Foundation also supports Side Effects Public Media.) In 2016, Project Point saw 83 patients, with 44 percent attending a follow-up visit. Since January, the program has been able to provide services to more than 180 patients. Social workers with the project help patients with other needs, including transportation and signing up for insurance. “The one thing that we heard a lot of before we started the program was ‘They’re not going to want to talk to you, they’re just going to want go out and get high again,’” Brucker says. But she says that wasn’t true of the patients she saw. Brucker says that overdoses can act as a sort of wake up call: People who have nearly died will be more likely to seek treatment. Around the country, other hospitals have started programs like Project Point, but they’re not easy to run effectively. Patient often face delays between an overdose and an appointment with an addiction treatment specialist. Her team at Yale-New Haven Health System had been connecting overdose patients with referrals to treatment. They decided to start prescribing patients an addiction medication, buprenorphine, to prevent withdrawals while patients waited for their appointments at addiction treatment centers. D’Onofrio’s team published research comparing this approach to a referral-only approach. The researchers found patients who received buprenorphine in the ER were more than twice as likely to be in treatment 30 days later than patients who only received a referral. Another study showed that the benefits of immediately providing buprenorphine had dropped six months later. D’Onofrio attributes the drop-off to the short period medication was provided; after 10 weeks, patients had to be transitioned to another treatment program or tapered off of buprenorphine. Stopping medication increases the risk of relapse. Brucker says she and her team are interested in trying D’Onofrio’s approach of immediately prescribing buprenorphine from the ER, but there’s a bigger problem: There aren’t enough providers to continue treatment in the community. Patients going through Project Point can still experience week-long waits for their first doctor’s appointment, Brucker says. For patients who don’t get a referral from Project Point staff, the wait to get into treatment can be even longer, Brucker says. Christopher Hinds says he dealt with that issue before. He called multiple treatment centers he knew about in Indianapolis, with no luck. This time, Project Point was able to connect him to a treatment center, where they started counseling and prescribed buprenorphine to help manage his addiction. Hinds now wants to become a peer recovery coach, to help others with addiction. And he says his family is cautiously optimistic about his recovery. He has relapsed a couple times — a normal part of addiction treatment. But he says it’s going well, that he is back in touch with his emotions, which his addiction had numbed.